It's hard to get excited for a Sacha Baron Cohen movie these days.What has he done since bringing Borat to the states in feature film form that has garnered him the same acclaim, but more importantly reached the same comedic heights? Bruno was a mess of shock for shock value alone while The Dictator ditched the mockumentary style altogether in favor of a traditional fiction narrative structure, but the laughs were still too few and far between to compare to Cohen's debut. Of course, Cohen is also known for his famous Ali G character, but has thankfully never brought that character to the big screen seeing as at this point the odds of it working out for the best are not in his favor. And so, four years after headlining his last major motion picture Cohen is back with frequent collaborator Peter Baynham and screenwriter Phil Johnston (Cedar Rapids, Wreck-It Ralph) to introduce us to a new character known as Nobby. Nobby was separated from his brother when they were younger and the two have grown up to be two very different men. Nobby is a father of nine children and married to the hottest woman in their poor English fishing town, Lindsey (Rebel Wilson). His brother, Sebastian (Mark Strong), on the other hand has become MI6's top assassin. It's easy to see where this screwball action comedy is going given this odd couple set-up, but with this new red band trailer we at least get a few solid sight gags and jokes that were absent from the previous green band trailers that only made the film look stupid and desperate. I still don't have much hope for this movie turning out well on any level, but I'm willing to give Cohen a shot, if at least with the faint hope that he may one day return to the level of Borat. 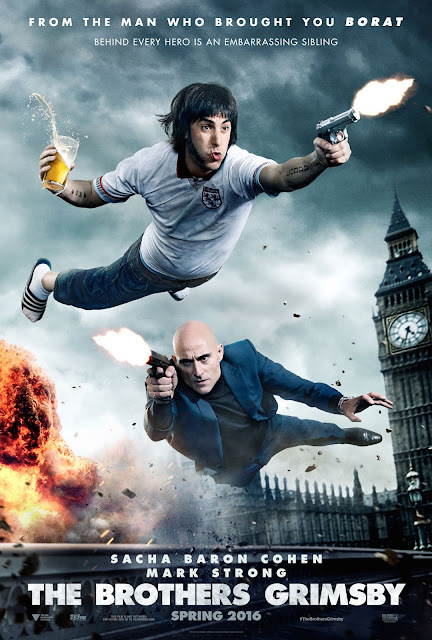 The Brothers Grimsby is directed by Louis Letterrier (Now You See Me) and also stars Penelope Cruz, Isla Fisher, Scott Adkins, Ian McShane, Gabourey Sidibe and opens March 11th, 2016. Synopsis: Nobby has everything a man from the poor English fishing town of Grimsby could want – 9 children and the most attractive girlfriend in northern England (Rebel Wilson). There’s only one thing missing in his life: his little brother, Sebastian. After they were adopted by different families as children, Nobby spent 28 years searching for him. Upon hearing of his location, Nobby sets off to reunite with his brother, unaware that not only is his brother an MI6 agent, but he’s just uncovered a plot that puts the world in danger. On the run and wrongfully accused, Sebastian realizes that if he is going to save the world, he will need the help of its biggest idiot.